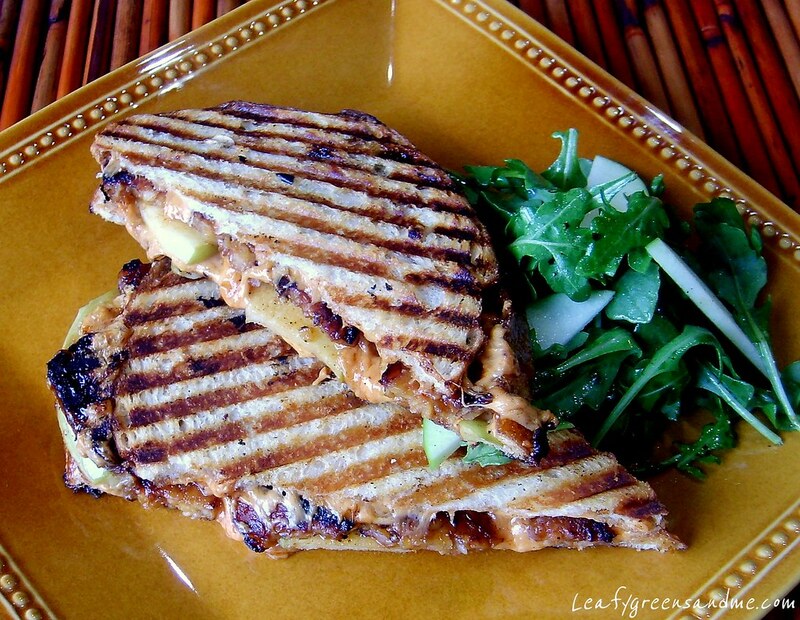 This panini is so delicious and perfect for this time of year with apples at their peak. I went to the Farmers' Market on Saturday and apples were everywhere. I've never seen so my different types. My favorite apple to cook with though is the Granny Smith. It holds its shape really well under high heat and doesn't get mealy or mushy. Also, it has a tart flavor and provides a nice contrast to the sweetness of the maple syrup. If you make this sandwich, you've got to make the glaze for the tempeh from scratch, instead of purchasing a flavored tempeh. The glaze coats and caramelizes the tempeh and adds a hint of sweet-smokiness and works really well with the apples and melted cheddar. Slice tempeh in half and steam for 12-15 minutes. Let cool and cut into thin strips, about 25-30. Heat panini press or cast iron grill/skillet. Brush both sides of bread lightly with Earth Balance or extra virgin olive oil. Turn bread over and spread one side with spicy brown mustard. Layer with Daiya cheese, sliced apple, maple glazed tempeh and more Daiya cheese. Drizzle with a little extra glaze, top with other slice of bread and grill until golden brown. Serve with a side salad of arugula, sliced apples and apple cider vinaigrette.